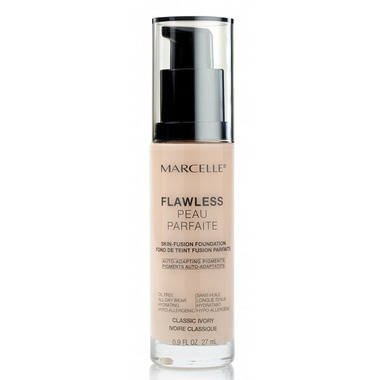 Marcelle Flawless Foundation is an oil-free foundation with customizable coverage that lasts all day. This Flawless Skin Fusion Foundation blends with skin for a natural finish without clogging pores. Enriched with vitamins A, C and E, this formula nourishes and hydrates your skin and provides you with a radiant complexion. The Flawless Foundation has a 10-hour staying power and is waterproof, keeping your makeup in place no matter what happens. This foundation is available in 6 shades and is suitable for all skin types. Hypoallergenic, perfume-free, paraben-free, oil-free and tested under dermatological control on sensitive skin. Very nice foundation, great coverage, not heavy or cakey, and lasts all day. I have sensitive skin with eczema, and this foundation doesn't cause any irritation, redness, or breakouts at all. I'm giving it 4 stars because the "Classic Ivory" shade is the fairest they offer, and it's got such a pink undertone to it, I have to mix it with my concealer or dreamtone white foundation (sometimes even just sunblock works) to get it a lighter shade for my fair complexion. Other than that, I do like this product and it's a great buy!